Computers are very literal, meaning they follow instructions exactly as it is written for them. They are not capable of rationalizing or guessing what is really meant for them or correcting human errors when input is incorrect. When computers are given the wrong instructions, they give the wrong results. Some people think that computers are very smart, but they are not, because without computer programmer writing instructions for them, a computer would simply be a well-designed, useless machine. Computer programming is the process of writing instructions that enable the computer to carry out instructions to perform specific tasks. The written instructions are referred to as computer programs. Computer programs are written in English and then converted to machine language, which is a language the computer can understand. Computer programs create applications or scripts to execute instructions. There are many types of programming languagesincludingC, C#, C++, COBOL, Fortran, Pascal, SQL, and Visual Basic. Once a person is familiar with one language, it is highly likely that he or she will learn additional languages as well. Choosing a language to learn greatly depends on what tasks a person would like to complete. For example, if a person would like to design video games, they would choose a language such as Java, C, C#, or C++. If a person is interested in designing a database, they would choose DBASE, SQL, or MYSQL. To design web pages, one would need to learn HTML, XML, or PHP. A person who writes the instructions for computers is called a computer programmer. They can write computer code to be run on computers or other devices like smartphones or tablets. There are two types of programming: applications and systems. Applications programmers write software applications while systems programmers develop operating systems. At times, these two will work together to ensure applications can run on specific operating systems. Computer programmers will need to communicate with managers and other users who request specific tasks. The programmer must have the ability to discuss program specifications write code to those exact specifications. They will also discuss deadlines and other important information. Before writing the programs, they may create detailed workflow charts and diagrams that describe program input, output, and the logical sequence of steps which will be used to write the program. After writing a program, the computer executes the program according to the instructions the programmer has written. The programmer ensures the program produced the desired output. If not, the programmer will have to debug the program which involves analyzing the program to correct any errors in code or program logic. The debugging process continues until the program produces the desired result. Debugging can take an undetermined amount of time, especially for large, complex programs. Over time, there may become a need to revise, update or expand existing computer programs in order to increase productivity or adapt to new requirements in end user needs, company policies or changes in local, state, or national laws. When such changes occur, programmers will need to update programs accordingly. Programmers must write and embed comments in computer code for others to understand functions carried out in the code. After successfully writing, updating, and executing a computer program, all aspects of that program must be documented and added to a company’s library for current or future use. In addition, they may also have to write user manuals or other training materials to guide users in using their program, application, or software. Typically, programmers have college degrees with majority of companies accepting no less than a bachelor’s degree. They can gain skills by taking online tutorials, enrolling in free courses online or onsite, or taking courses at a college or university. While in college, students should seek to obtain experience through working in internship positions. Internships can be obtained by searching online career sites or communicating with career services counselors in schools, colleges, or universities. To work as a computer programmer, one typically needs a bachelor’s degree in computer science, information systems, or mathematics. Additional coursework in specialized fields such as healthcare or accounting may also be completed in order for you to be more effective. Very few programmers have an associate’s or high school diploma, but can get jobs because they most likely have significant work experience instead. Experience is very important in computer fields so it is best for students to seek internships while completing their degree. Once a person becomes a programmer, they must continuously update his or her skills because the computer industry is always changing. A computer programmer must be a strong analytical thinker and problem solver as he or she will have to troubleshoot program errors. They must also have strong written and verbal communication skills as they will have to interview clients and discuss details such as program requirements and program outcomes. Compensation for programmers are highly affected by location, level of education, experience, industry, and company size. The pay for this job can begin at $45,343, the average is about $84,940 per year. Higher salaries can peak into $131,120 and up and increase as you get promoted to management level positions. The states employing the highest number of programmers are California, Texas, New York, Illinois, and New Jersey. The states paying the highest salaries are Washington, New Mexico, Colorado, District of Columbia, and California. The outlook for the programming field is positive, but somewhat slow. Programming is expected to add 43,700 new jobs or 12% growth through 2020. This growth rate is average compared to related computer positions. Perhaps the biggest advantage of being a computer programmer is salary. Employees who are experienced and work in companies get paid higher salaries which increases in management or related roles such as applications analyst, programmer analyst, systems analyst, and web developer. Contract programmers providing programming services can get paid $100 to $400 an hour based on the job and company needing the work. Programmers are needed all over the world and in basically every industry in existence. And, as computers continue to rapidly advance in new technologies such as smart phones and video games, the job outlook will continue to grow. Programmers, even those who are less experienced, have a high chance of always finding employment no matter which state they reside. Although many companies prefer employees with a bachelor’s degree, there are chances that you can get hired without having a bachelor’s degree. Training programs are available to equip programmers with the necessary skills to start in entry-level positions. Most of these training programs can be completed in as little as six months. There is a lot of opportunity for advancement and growth once programmers obtain entry-level positions. Computer programming offers great flexibility because it is a job that can be performed at home, in the office, or any place in which a person can access a computer. Programmers can work from home for a company or as a freelancer, eliminating the additional responsibilities that come with working scheduled shifts in an office environment. The majority of programmers are highly satisfied with their jobs; however, being a programmer is no easy task. Computer programming is very stressful so you must know how to work well under pressure and in fast-paced, demanding environments. 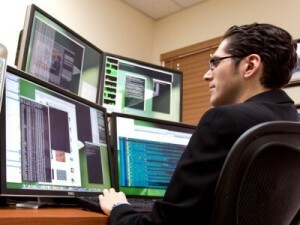 Programmers often have to stay and work extra hours to meet critical deadlines, which means countless hours of sitting down at the computer glaring at a computer screen. Sitting down all day leads to a sedentary lifestyle, which results in weight gain, muscular strain and aches, eye strain, and increased risk of health issues such as cardiovascular disease and stroke. You must always update your knowledge and skills as the information technology industry is always changing and new technologies or programming languages are always being developed. If you are not able to keep their skills updated, you can quickly become obsolete and are no longer marketable. Staying marketable includes consistently learning new languages and skills through additional college or training programs. New and experienced programmers should follow this helpful advice for entering and surviving the fast-paced, challenging, and rewarding field of programming. Do not choose computer programming because of the money or job outlook. Be team-oriented as programmers work with teams of people to accomplish programming tasks. Be prepared to answer behavioral type questions to determine examples of situations where there was a demonstrated ability, to use verbal and or written communication skills, to solve conflicts or problems, handle stress, and work well under pressure. Be prepared to demonstrate skills as interviewers will probe for the programmer’s level of technical knowledge by asking them to solve hypothetical problems or write sample programs. Be prepared to show prospective employers actual programs by creating web-based portfolio of assignments or projects. This creates a greater chance of obtaining jobs. Stay abreast of new trends and technological advances. Learn more than one programming language. Continue to update programming skills through continuous learning through tutorials, college or training programs.